The Colosseum is the most visited sight in Italy. Tickets for the Colosseum are also valid for the neighbouring excavation Forum Romanum and Palatin. Thus, these ancient sights are also visited by thousands of people every day. There are normal tickets for the Colosseum and the other sights. But there are also other tickets. On the one hand there are of course guided tours, also offers in English language. On the other hand there are for example tours into the inner cellars of the Colosseum. This is very interesting. From here the gladiators came up into the arena, here were the cages of the wild animals and the whole shows were steered from the underground. Important: With all internet tickets for the Colosseum you should take care to buy tickets without queuing. In any case, you should buy such tickets online beforehand. The queues at the entrance of the Colosseum are often hours long, from in the early morning. The tickets without queuing are also called „Skip the line tickets“. There is a lot going on. On average about 20,000 visitors come to the Colosseum every day, in summer it can be over 50,000. The few cash registers are quickly overloaded. You will find our general article about the Colosseum on this page (description, history, opening hours Colosseum…). You should also make sure that you book a tour in a language that you understand. There is a guided tour through the Colosseum in English. In the following 5 different tickets for the Colosseum Rome. All of them can be booked online by clicking on the links. All 5 tours have good ratings on the Internet. A lot of visitors buy that. You can pass the long queue with your online ticket, quickly to the Colosseum Rome. You can walk around alone and have a look at a lot of things. You don’t get into the interesting basements and you don’t have a guide. You should inform yourself well beforehand. The visit of the Forum Romanum (very big, plan a lot of time) incl. Palatine is included. Compact, inexpensive guided tour through the Colosseum. One hour with entrance without long queues. This Colosseum tour also has good reviews on the Internet. 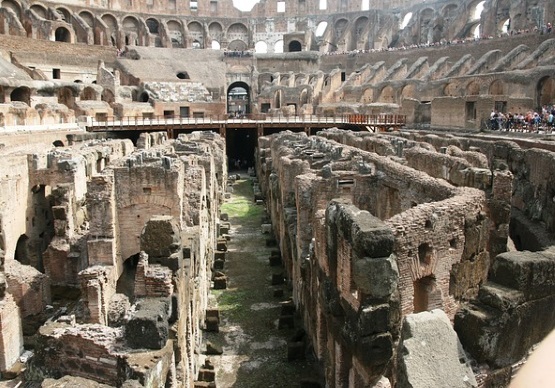 This great tour includes the above mentioned cellar of the Colosseum. In antiquity there was all the technology here, the elevators to the arena and the wild animals. Very interesting. Only a very limited number of visitors can enter, so these exclusive tours are somewhat expensive. They are also not available in German, but in English. This tour has extremely good ratings from participants. On this tour, the Colosseum is the highlight, but not the only thing one sees. We also visit the Forum Romanum, the Capitoline Hill, the place where Caesar was murdered, the Pantheon and much more. Complete guided tour through ancient Rome. Great thing, bookable in German language. Very good rating and hardly more expensive than the tours with less content.